ProxySQL is the leader in proxy and load balancing solution for MySQL. 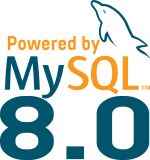 It has great features like query caching, multiplexing, mirroring, read/write splitting, routing, etc… The latest enhancement in ProxySQL is the native support of MySQL Group Replication. No more need to use an external script within the scheduler like I explained in this previous post. This implementation supports Groups in Single-Primary and in Multi-Primary mode. It is even possible to setup a Multi-Primary Group but dedicate writes on only one member. René, the main developer of ProxySQL, went even further. For example in a 7 nodes clusters (Group of 7 members) where all nodes are writers (Multi-Primary mode), it’s possible to decide to have only 2 writers, 3 readers and 2 backup-writers. This mean that ProxySQL will see all the nodes as possible writers but will only route writes on 2 nodes (add them in the writer hostgroup, because we decided to limit it to 2 writers for example), then it will add the others in the backup-writers group, this group defines the other writer candidates. An finally add 2 in the readers hostgroup. It’s also possible to limit the access to a member that is slower in applying the replicated transactions (applying queue reaching a threshold). It is time to have a look at this new ProxySQL version. The version supporting MySQL Group Replication is 1.4.0 and currently is only available on github (but stay tuned for a new release soon). This is the table we will use to setup in which hostgroup a node will belongs. The Writer (Primary-Master) is mysql1 (192.168.90.2 in hostgroup 2) and the others are in the read hostgroup (id=3). As you can see, there is no more need to create a scheduler calling an external script with complex rules to move the servers in the right hostgroup. Now to use the proxy, it’s exactly as usual, you need to create users associated to default hostgroup or add routing rules. 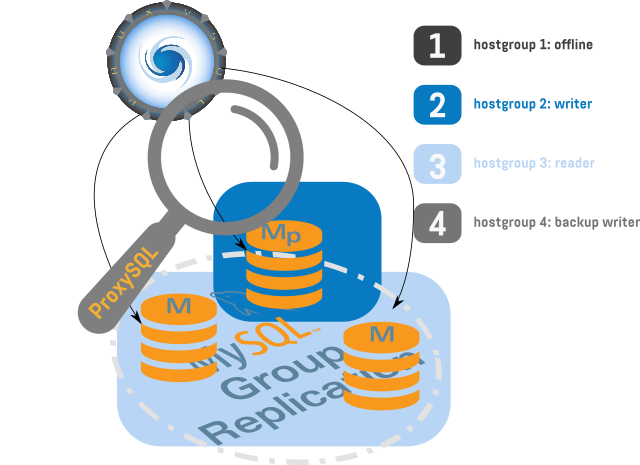 Enjoy MySQL Group Replication & ProxySQL ! Just to be clear: for group replication we do not need query rules anymore, because they are implemented by default? You still need to have some rules if your Primary-Master node is not part of the default hostgroup assigned to the user. Hi, and thanks for the answer! why i just got the back_write hostgroup. Like that I can’t really tell you why… please check proxySQL’s log file. The node of MGR variable read_only is OFF, If I need to adjust it. and the follow step, if I need execute it at every node of MGR. now I do it at every node. I think if i made mistake. I found if I modify the read_only at MGR , the runtime_mysql_servers hostgroup list can be changed. I think it’s automatic. There is no need to modify. when we try to execute stop group_replication, we found that all queries by proxysql to check mgr status are hang , and cannot be killed. can’t upload the pic. We have encountered this situation more than once. proxysql seems not support to set timeout for the check sql.